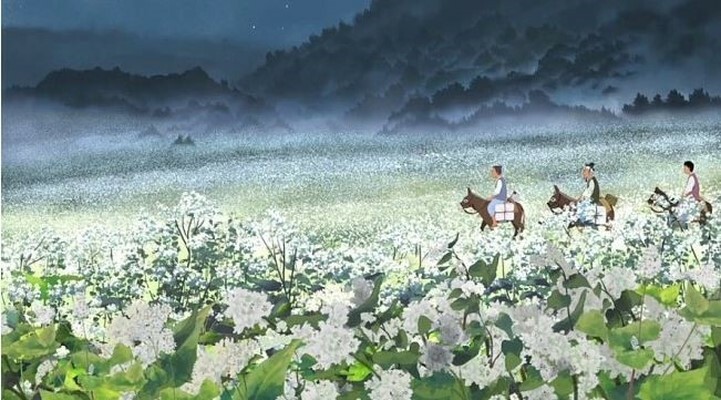 Image from 'Buckwheat Flower, a Lucky Day, and Spring' (2014), directed by Ahn Jae-hoon and partly based on a story by Lee Hyoseok. It seemed as if the late summer sun had stopped moving in the sky, making the heat of the afternoon even more oppressive. The torpor that lay over the grounds of Seoul Station was in sharp contrast to the ringing clamour inside, indicating the imminent arrival of the 3.30 express train bound for Xinjiang. A single hired sedan made its way to the fore of the countless black automobiles arrayed in front of the station, and from it emerged a man holding a bouquet of flowers. It was the novelist Mun Hun, rather plainly attired. After checking the time on the station tower clock, he entered the building. He smiled somewhat self-consciously at the awkward appearance he knew he was presenting by holding such a large bundle of flowers that was attracting so many stares. While walking through the lobby, Hun ran into the young medical doctor Pak Neungbo, who was also roaming the premises as if in search of something. He was one of the all too many freshly-minted doctors, little black tuft of a moustache and all, that one could see on the streets these days. They exited the lobby and paced about in front of the station store. The two of them – one holding a bottle, the other a bouquet – continued to look for Cheon Ilma, the mutual friend they had come to see off, but he was nowhere to be found. They went through the lobby once more, looked inside the tearoom, and then ran up to the eatery on the second floor, all without success. Ilma had a reason for being late. The regular coach ticket to Harbin he had purchased a few days ago had unexpectedly been upgraded to a deluxe first-class ticket today. Thanks to the patronage of the president of the Hyundai Daily newspaper, with whom coincidence had recently brought him into dealings, the present trip was dubbed a commission. Such work carried with it preferable treatment with regard to travel expenses, as well as considerations relating to the company’s image, and, as such, the order was put in for a deluxe first-class ticket. By the time he had gone down to the agency, turned in his original ticket, and gotten the new one, the train was getting ready to depart. There were only thirty minutes left before departure when Ilma and Kim Jongse, a fellow newspaperman who the president had ordered to see him off, finally got in the car for the station. A certain satisfaction welled up in Ilma as he ordered the driver to step on it while sinking back into the plush seat. Ilma’s duties as a cultural envoy were actually quite simple. He was to go to Harbin and negotiate the invitation of a symphony orchestra. Although there was no mention of an occupation on Ilma’s business card, while writing commentaries on current cultural topics and critical essays on music, he had naturally come to be considered, by himself and others, as a culture mediator. Recent displays of his talents in the field, including successfully arranging for the performances of renowned theatrical and dance troupes from Tokyo, had brought Ilma to the attention of certain people. One of them was the president of the Hyundai Daily, who now had his sights set on the Harbin Symphony Orchestra and had hired Ilma as his representative in the negotiations for a performance. It was something Ilma could have arranged on his own, but, knowing the newspaper’s backing would prove advantageous, he immediately accepted the president’s terms and began preparing for the trip.